I remembered that a couple years ago, I was given a Wagyu strip steak for Christmas. I know some pretty awesome, generous people. I am very lucky. Wagyu steak comes from Japanese cows that are genetically predisposed to yield meat with a higher fat content than typical beef. Fat equals flavor, especially in meat. Intensely marbled, Wagyu is considered the best beef in the world. And it's fairly pricey. I knew right away that I didn't want to cook that steak; I didn't want to risk ruining it. 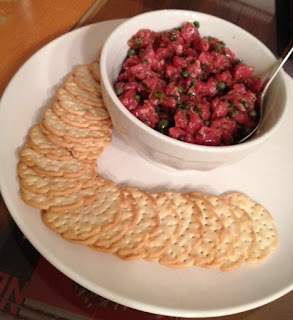 Instead, I decided to make tartare for Christmas Eve that year. When would I have the chance to make--let alone eat--Wagyu tartare again? And, I mean, if you're going to eat raw beef, it should be the best beef you can get your hands on....right? So, I trimmed and chopped up the steak, then mixed it with a couple tablespoons of capers, the zest of a Meyer lemon, a handful of chopped parsley, some olive oil, a pinch of salt, and lots of coarsely-ground black pepper.